Quite a few years ago I became aware of the existence of graphics tablets. I don't recall when this discovery happened, but I do remember that my hopes to own such a cool tool quickly faded when I saw the sticker price. Way back when, the cheapest Wacom graphics tablets cost about $600 or so. 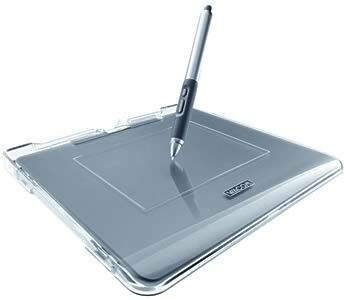 A graphics tablet is a computer peripheral that allows input via drawing on an electromagnetic pad with a special pen called a stylus. Essentially, this means that one can draw and see the results of their movements on screen - much like a handheld or Palm device, but with far greater resolution and accuracy. The pen also works like a mouse, able to move the cursor, click on windows and buttons, and perform any other normal computing functions. The benefit of such a tool is obvious to an artist. It allows more of a traditional drawing motion, rather than using a mouse. Drawing with a mouse is very awkward and limiting. Drawing with a graphics tablet feels more natural. In addition, most tablets are sensitive to varying levels of pressure. Pressing harder with the pen may cause a drawn line to be thicker, darker, or vary in color. The possibilities are virtually endless. I'm really excited about this new functionality because one of favorite observations in my own drawings is varying line thickness and quality. Such effects are impossible to achieve with a mouse. Most middle to high end graphics applications support this pressure sensitivity to some degree or another. To name a few supporing titles: Adobe Photoshop, Adobe Illustrator, CorelDRAW, Corel Photo-paint, Corel Painter, Macromedia (now Adobe) Flash, Macromedia Fireworks, Macromedia Freehand, Paint Shop Pro, the GIMP, and many others. While there are several companies who produce graphics tablets, Wacom is currently the undisputed leader in the industry. When I asked my boss at work if she had ever used a graphics tablet before, she remembered that she had seen one in our art department. We looked and asked around, and sure enough, there it was! I have been using the Wacom graphics tablet at work for virtually everything (except keyboard input, of course) for the last week or so. It definitely takes a while to get used to, but I am pretty excited about the possibilities. I just recently ordered one online after noticing an extreme drop in price since I last looked several years ago. I'll write more about it when I have more time to experiment at home. I have access to all the aforementioned graphics applications (except Illustrator) and will do my best to test the tablet in all and describe what I find to be the pros and cons of the pen's behavior in each.